During the early 1800’s there arose in Japan an idealogy that rallied around deposing the Tokugawa Shogunate and replacing the Emperor to the throne. Clans were the political parties of the time and the Aizu clan was in favor of the Shogun. The Aizu leader Katamori Matsudaira had served the Shogunate for many years and thus the loyalty of the Aizu lay with the Shogun. The Aizu fought many battles in an attempt to keep the Emperor and his forces from the throne. They were pivotal in the Bakumatsu wars. Now, their political lifestyle was threatened by the Choshu and Satsuma clans who were in support of the Emperor. As a result of their opposing idealogies, the Aizu samurai under the leadership of Saigo Tanomo (1830 – 1905) clashed against the forces of Choshu and Satsuma at Shirakawaguchi. Saigo Tanomo was an Aikijujutsu and Kenjutsu student under Takeda Soemon (1758 – 1853). Saigo had studied for years with the Takeda schools and was a famous warrior even though he was defeated by the Choshu and Satsuma clans. Because of this loss, however, the family of Saigo Tanomo, 21 in all, committed suicide thinking that Tanomo had been killed. Unknown to his family, Saigo Tanomo survived the battle of Shirakawaguchi! Now that his family was gone, Tanomo returned to Aizu and became a teacher of Mizoguchi Ha Itto-Ryu and Koshu-Ryu Gungaku kenjutsu. In 1876 Tanomo received a new student into his tradition named Takeda Sokaku (1860 – 1943). Sokaku, the grandson of Takeda Soemon was born in Aizu on 10 October 1860. He studied Aikijujutsu from his grandfather and other arts from his father. By the time he was 16 he had studied Jikishinkage-Ryu kenjutsu from Sakakibara Kenkichi and received his Menkyo Kaiden in Ono Ha Itto-Ryu from Toma Shibuya of Tokyo. Tanomo remembered Sokaku’s grandfather well, as he had also been taught by him. For 3 years Sokaku studied Daito-Ryu with Saigo and mastered many arts such as Aikijujutsu, Battojutsu, Yarijutsu and Kenjutsu. Finally in 1880 at the Nikko Toshogu Shrine, Tanomo passed on all his knowledge including the secret teachings to Sokaku. From that day forward, Takeda Sokaku would be headmaster of Daito-Ryu. For almost 20 years Tekada Sokaku wandered from dojo to dojo, challenging every known martial arts master, and he was never defeated. He took time in his travels to instruct others, often staying with the student for a period of time before moving on. He intelligently concentrated on government officials and military leaders as well as local police departments for his student body. In this manner his reputation spread quickly. After the dissolution of the samurai in the late 1800’s contact with the Americans became more frequent for the Japanese. Not only was this the American’s first contact with the Japanese culture, but also with the Japanese martial arts. Sokaku, in one single event sparked wonder in the minds of Americans about the martial arts of Japan. In 1904 a fateful meeting between American teacher Charles Parry and Takeda Sokaku occurred on a train in Japan. An argument ensued between the two about seating in the first class section of the train, and inevitably Sokaku found it necessary to restrain the large foreigner. Amazed at how helpless he was against a 4’11” man, Parry reported to his superiors in the U.S. of the great power of Aikijujutsu. President Roosevelt sent for an Aikijujutsu instructor to come to the U.S. and put on a formal demonstration of the art. Takeda sent Police Officer Shinzo Harade between 1904 and 1910, who immediately gained great renown and many students including Charles Parry. He involved himself in the instruction of Police forces and in exhibitions for dignitaries and public officials. Takeda Sokaku died on 25 April 1943 at Amori Station in Honshu, leaving behind his great tradition to his son Takeda Tokimune and his senior students Hisa Takuma, Sagawa Yukiyoshi, Yamada Taisaburo, Matsuda Toyosaku, Yamamoto Kakuyoshi and Ueshiba Morihei. Takeda Tokimune currently teaches in Abaragi prefecture, Hokkaido, Japan. At the end of the 1800’s the Samurai were politically disbanded and many Jujutsu/Kenjutsu schools died out. A few survived, however. Jujutsu schools came in from the countryside to the city, and by doing so were exposed to other ryu. There were many contests between Jujutsu schools at the time, each trying to prove they were the best. Many Jujutsu styles were defeated and discredited, some unjustly. Nevertheless, they were forced out of existence, or the practitioners simply joined other ryu. It was also a time of bullying on the part of the Jujutsuka. Many of the younger students found enjoyment in trying the techniques out on unsuspecting city folk. Also, many bar brawls were started in order to practice their techniques. Jujutsu itself fell into ill repute and many of it’s practitioners were seen as trouble makers. Because of this view the practice of Jujutsu was restricted to a very few traditional schools. It was in 1882 that things began to change. It was in that year that Kano Jigoro founded a new type of Jujutsu that he called Judo. Kano was a Jujutsu master who had studied under senseis Teinosuke Yagi and Hachinosuke Fukada of the Tenshin Shin’Yo-Ryu. Later he also studied under the tutelage of Tsunetoshi Iikubu of the Kito-Ryu. He also studied a while with the Sekiguchi-Ryu. Kano was born in a small costal town outside of Kobe, Japan in 1860. His main martial theories were developed by his study of the “secret” books HONTAI and SEIKO which discuss the fundamentals of Nage (throwing) through the principle of KI-TO (to raise up – to strike down). This, combined with his grappling knowledge from the Tenshin Shin’Yo-Ryu led Kano to retire to the solitude of the Eishoji temple and develop his Judo. What made Kano’s Jujutsu different was his approach to training. Because he sought to preserve the Jujutsu techniques, but realized that Jujutsu had a bad reputation, he changed the entire philosophy surrounding his art. Kano emphasized the physical fitness aspects of the art and altered the techniques to make them appealing to the general public. The sporting aspect of the art was also suggested. Kano arranged KATA, (prearranged forms) for the self defense techniques in order to ensure safety and enjoyment in learning, but retained SHIAI (contest) to test timing and technique in s semi-combat situation. Kano also invented the ranking system that consisted of KYU ranks (trainees) and DAN ranks (graded). Before Kano the ranking system was non-existent. Kano also targeted government and military officials as his primary student population. By doing this the popularity of his Judo spread quickly. Of course, it must be realized that Kano’s Judo achieved it’s notoriety because of Aikijujutsu. It seems that Kano was an excellent Jujutsuka himself, but felt that in order to prove that his new for was “undefeatable” he would need to employ an “undefeatable” representative of his new art form. This man was Saigo Shida who changed his name to Saigo Shiro (1867 – 1922). Shiro was the adopted son of Aikijujutsu master Saigo Tanomo. Shiro was a master of Daito-Ryu at a young age and was trained for the headmastership of the Takeda tradition, but was recruited by Kano to be his “showman” for the Kodokan system. This is basically why Takeda Sokaku became Daito-Ryu’s headmaster. Shiro was known for his great ability and strength at a young age. In fact, he was a Godan (5th degree) by the age of 21. In the contests set up between the Kodokan and the area Jujutsu schools, Saigo easily defeated all opponents, mostly with his favorite technique YAMA ARASHI. 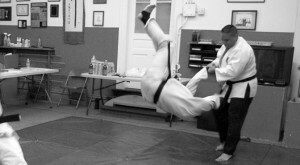 Kodokan was “proving” its worth by using Aikijujutsu, although most of the techniques Saigo used were never taught by Kano. As a matter of fact, whereas Aikijujutsu had over a thousand techniques, the Kodokan system boasted about 150. After many years Saigo Shiro left the Kodokan and became a reporter and master of Kyudo (archery). Only when Saigo left the Kodokan did the style move into the realm of martial sport. Saigo Shiro, perhaps one of the world’s greatest Jujutsuka died on 23 December 1922 at the age of 57. By the time Judo moved into the 20th century, many of the KORYU or “ancient schools” were gone or disappearing. Thus, it was the perfect time for Judo to come on strong. Kano made his Judo the standard physical education for the Japanese Police Force and Army. Judo was also popularized in the United States. In 1889, Kano had sent Yamashita Yoshiaki to the U.S. to live and instruct Judo at Harvard University and at the Annapolis Academy. This had greatly enhanced the popularity of Judo with the new American audience. Even though Kano had, in fact, used Aikijujutsu to make his art famous, he did do Jujutsu a great service. If it were not for the renewed interest in the grappling arts caused by Judo there is a distinct possibility that Jujutsu would have never survived as a martial art. After an illustrious career, Kano died while travelling at sea in 1938. Today Judo is practiced all over the world and is a sport in the Olympics. Ueshiba Morihei, one of the senior students of Takeda Sokaku was born on 14 December 1883 in the Motomachi district of Tanabe City in Wakayama Prefecture. As a young man he moved to Tokyo and there studied Kito-Ryu Jujutsu and Shinkage-Ryu kenjutsu. Around 1903 he joined the military and served in the Russo-Japanese war. In 1912 he moved to the northern island of Hokkaido with a Japanese resettlement project and became one of the community heads. While he lived in Hokkaido he was introduced to Takeda Sokaku by Yoshida Kotaro. For the next 7 years he studied Daito-Ryu Aikijujutsu with Takeda. In 1922 at the age of 39 he was granted, along with 20 other students, the teaching license called KYOJU DAIRI. This meant he was considered to have mastered most of the Daito-Ryu techniques that numbered around 350. Two other students of Takeda received higher degrees; Hisa Takuma received KAIDEN and Sagawa Yukiyoshi received SHODEN. The SHODEN meant he had learned the complete catalog of arts numbering about 2800 techniques. Yukiyoshi became the 36th Soke (headmaster) of Daito-Ryu, but upon the death of Sokaku, relinquished the headmastership to Tokimune, Sokaku’s son. In 1936 Ueshiba opened his first school in Tokyo. Ueshiba called his art many names including: Ueshiba Juku Aikijujutsu, Aikibujutsu, Kobukai Aikibudo, Tenshin Aikibodo, Takemusu Aiki and Aikido. He finally chose to stick with the name Aikido in 1942. Prior to WWII his dojo was known as Jigoku dojo or “hell” dojo. The students of this school were subjected to grueling workouts that lasted many hours and in which several people could be injured in one day. These students, however, became the best of the Aikido practitioners. Some were: Shioda Gozo, Hirai Minoru, Rinjiro Shirata, Saito Morihiro, Mochizuki Minoru and Tomiki Kenji. Saito and Shioda seemed to have retained the closest style to that of the old Daito-Ryu system. In 1942 Ueshiba moved to Iwama in the Ibaragi Prefecture where he built a dojo (still run by Saito Sensei today), and became a farmer. One reason for this change in lifestyle was his involvement in the Omoto Kyo Shinto sect led by Deguchi Onisaburo. After 1945 Ueshiba began to teach again in Tokyo. 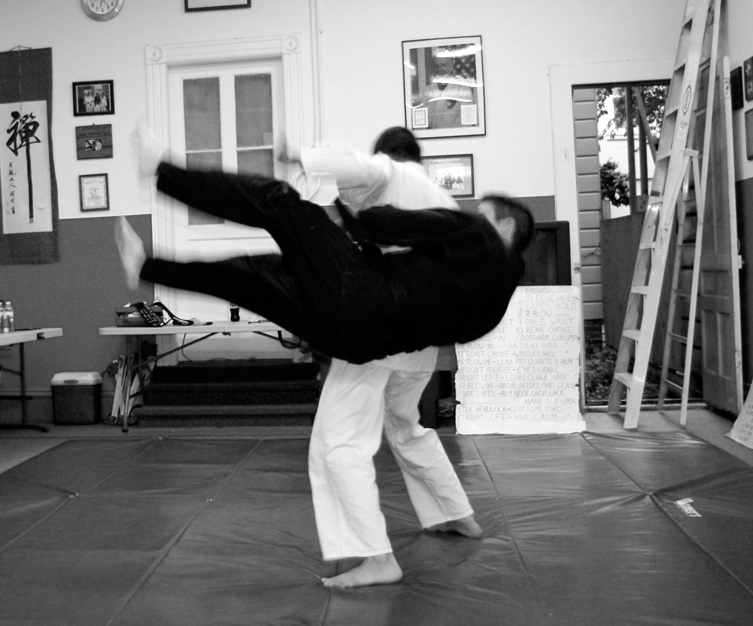 It was there that the first changes came to Aikijujutsu. Older now, and under the mental and spiritual influences of Omoto Kyo, he began to change the emphasis of Aikido from martial arts training to perfection of the spiritual self through discipline, breath power and harmonious movement with others. Aikido was the way. Now as Aikido moved away from the martial aspect, it was accepted by the occupying U.S. forces as a “non-martial” form of physical education. Because of the need for peace, his school out-shone all others of Aikijujutsu in Japan. And, because of his charisma he parlayed his art into a worldwide phenomenon. Ueshiba Morihei died 26 April 1969 leaving his son Kisshomaru in charge as the second headmaster of Aikido. Several other forms of Aikido have developed today. Two are very influential. Those are the Tomiki school and the Yoshinkai. The Tomiki school was founded by one of the top students of Ueshiba; Tomiki Kenji. The style was developed to firstly, remove the supernatural aspects from the art, and secondly to allow competition. The Yoshinkai form was developed by Shioda Gozo, another of Ueshiba’s top students. Shioda’s form strives to retain the original Daito-Ryu Aikijujutsu methods. His U.S. representative is Takashi Kushida. From the Yoshinkan have stemmed many schools claiming direct lineage to true Aikijujutsu, especially Daito-Ryu. In a way, this is true, because from Takeda through Ueshiba and Shioda, the “new” Aikijujutsu schools have come into existence. What must be realized is that there are still schools today that practice actual Daito-Ryu Aikijujutsu directly from either the Japanese source or from the assigned U.S. representatives. This does not make the other schools invalid, however. One must just realize their origins in the scope of Jujutsu history. In the late 1800’s a master of Yoshin-Ryu; one Tanaka Yoshimatsu opened a dojo in Hilo, Hawaii which he called SHINYU-KAI. One of his students; Henry Sieshiro Okazaki became pivotal in the dissemination of Jujutsu in the modern world. Henry Sieshiro Okazaki was born on January 28, 1890 in Fukushima Prefecture, Honshu, Japan. He moved to Hilo, Hawaii in 1906. When he was young he found himself in ill health. It was the practice of Jujutsu, he felt, that eventually cured him of his maladies. Eventually becoming a Jujutsu master himself, he decided to break from tradition and to teach his art to non-Japanese. Okazaki was not regarded well by his peers for this decision, but he felt that Jujutsu should be for all people. Okazaki began to teach U.S. military men stationed in Hawaii and received attention from the public for this. In 1921 he accepted a challenge from heavyweight boxing champion K.O. Morris, who claimed to have travelled throughout Japan defeating Judo and Jujutsu men with boxing. In a highly publicized fight, Okazaki defeated Morris by breaking his arm, even though Okazaki did receive a broken nose in the effort. This victory greatly improved the reputation of Jujutsu. Okazaki sensei opened his first school in 1930 and finally established a permanent dojo, the HAWAIIAN JUJUTSU GUILD (later called the AMERICAN JUDO AND JUJUTSU INSTITUTE OF HAWAII) in Honolulu in 1936. Okazaki also travelled to Japan and made some extensive studies of other Jujutsu such as Yoshin-Ryu, Kosogabe-Ryu, Nambashoshin-Ryu and Shibukawa-Ryu. He also studied Ryukyuan Karate, Hawaiian Lua, Kung Fu and Kodokan Judo, in which he also received a Black Belt. After making these studies Okazaki began to form his own style of Jujutsu. He called the style Kodenkan/Danzan-Ryu. Kodenkan means “School of the Ancient Tradition” and Danzan means “Cedar Mountains”, the ancient Japanese name for the Hawaiian islands. From this system Jujutsu spread first to the United States. Henry Sieshiro Okazaki died in July 1951. His son Hachiro now runs the famous Nikko Restoration and Massage Sanitorium in Honolulu, Hawaii. Ramon Ancho is the presiding elder of the system and has appeared in many movies. He was a high ranking military man and now does private instruction to government agencies as well as performing types of bodyguard duties in foreign countries. Prof. and Shihan Sig Kufferath is the Soke (headmaster) of Kodenkan/Danzan-Ryu and teaches in the Los Angeles, CA area. He also gives private seminars and personal instruction in a few other areas of the country. Shihan Fransisco Limbago is the current president of the AJI. During the early part of this century Jujutsu made a big influx into the American martial arts scene by US contact with the orient during the Second World War. Many soldiers returned with training, however slight, and truly raised the popularity of the grappling arts. One Jujutsu style, Hakko-Ryu came on the western scene in the 1940’s. Founded 1 June 1941 by Okuyama Yoshiji (Yoshinobu) Ryuho, Hakko-Ryu picked up a small following in the U.S. quickly. Okuyama was born February 21, 1901 in Yachi Cho, Japan. Yoshiji learned from Daito-Ryu master Matsuda Toshimi (Hosaku). Okuyama made some small changes and developed several theories of unarmed combat. Hakko-Ryu is designed to thwart attacks by applying pressure to the body’s kieraku (meridians) to cause intense but nondamaging pain and thus destroys the attackers will to continue. Okuyama created the system based on the belief that the successful application of technique versus physical strength could neutralize and control any attacker. Hakko-Ryu means “School of the Eighth Light”. The Hakko-Ryu Hombu is located in Satama Prefecture and their heir apparent is Okuyama Toshio. The US representatives are Dennis Palumbo of Colorado and Brian Workman of Washington state. Gracie Jujutsu was founded by Helio Gracie of Brazil. Carlos Gracie, his brother had met the leader of a Japanese resettlement colony named Maeda Esai (a.k.a. Count Koma). Maeda taught Helio Gracie the art of Jujutsu and eventually taught four of the Gracie brothers. In 1925 Carlos and his brothers opened the first Jujutsu dojo in Brazil. Helio stood out the most of the brothers and developed the original techniques into what is now called Gracie Jujutsu. The Gracie family is the largest “sports” family in history with 40 active members. The Gracie family is known for having an open challenge for anyone to fight against their Jujutsu; no holds barred style. Today they have U.S. representatives in California. Goshin Jutsu was founded by Tanaka Tatsu around 1950. Tanaka had studied classical Jujutsu for years, and when he finally opened his own dojo in Tokyo in 1952, he decided to eliminate the injurious techniques from his art. He removed kicking, striking and leg tripping. Instead he concentrated on pressure point Atemi, Kansetsu and Nage techniques. There are 150 basic techniques in his form and Tanaka states that his main purpose in the development of his art was to promote good health through exercise and proper knowledge of self defense. Small Circle Jujutsu was founded by Wally Jay. Jay was born in Hawaii on 15 June 1917. Early in life he studied boxing and in 1935 began Jujutsu under Paul Kaelemakule. In 1940 he started to study Kodenkan/Danzan-Ryu Jujutsu under the top student of Henry S. Okazaki; Juan Gomez. He also studied Judo under Ken Kawachi with whom he credits for the catalyst that started the small circle theory. He also received his oriental therapeutic massage (Siefukujutsu) diploma from Henry S. Okazaki. In 1950 he moved to California and began to teach Jujutsu. From the 1960’s on he has toured extensively teaching his style which is based on the theory that a small tight circular movement by the Jujutsuka’s hands make the techniques more painful and effective. He resides in Alameda, California. Zen Budokai Jujutsu – The system that has come to be known as Zen Budokai stems from the genius of one man – Hanshi Raymond “Duke” Moore. Duke Moore began his training with Ray Law – a student of Seishiro Okazaki of the Danzan Ryu. Duke Moore began in the early 1940’s and has studied and received senior black belt ranks in Kyokushin Karate from Mas Oyama, Judo from George Yoshida, Danzan-Ryu Jujutsu from Ray Law and Bud Estes, Kempo Karate and Aikijutsu from Richard Kim, and Jujutsu from Kiyose Nakae. He founded his system, a combination of the best of all of his knowledge in the early 60’s. He opened the now famous Market Street Dojo in San Francisco, CA, and then oversaw over 10 dojo in Northern California for many years. He was awarded, in the early 80’s the title of Hanshi and the rank of Judan, 10th degree blackbelt by a board of senior blackbelts from many different martial arts. In the early 80’s he also founded ATAMA, American Teachers Association of the Martial Arts. Today this is a worldwide organization that credentials martial arts instructors by a rigid set of standards. Because of the reputation of his various schools, the system is today referred to as the ZenBudo-Ryu. His school was named the Zen Budokai. Duke Moore passed away in 2003, assigning Tim Delgman (9th Dan) as successor to the ZenBudo-Ryu.